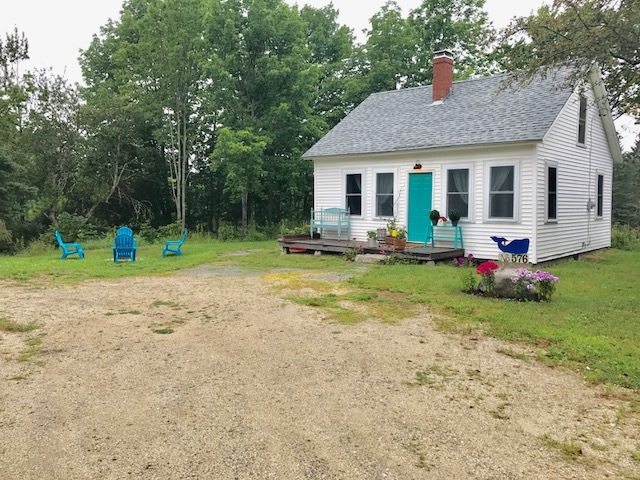 DESCRIPTION:Updated late 1800's cape farmhouse tucked into a Christmas Tree farm in the quintessential lobster town of Blue Hill, Maine. Ample parking for a modest boat to launch at Blue Hill dock. Wade at low tide at the beach/park overlooking nearby islands. There's a very nice, clean, playground there. Well appointed, comfortable and exceedingly unique. Bright colors, sunny rooms, clean and refreshed farmhouse cape that is at once quaint and cheery. A great place to write a novel! Three separate sleeping areas with two private rooms and a sleeping loft. A petite flat screen TV/DVD player for late night movies and Flashback Atari showdowns!Eat lunch outside on the picnic table, or have an evening cocktail via outdoor lantern-light. Fire pit to roast weenies or make smores, or just get warm on a chilly evening. LAYOUT: FIRST LEVEL: Entry into the Living Room, Dining Room off to the left, Kitchen, Full bath and a first floor bedroom with a Queen bed. SECOND LEVEL: To the left is a loft area with a Twin size bed, to the right is a bedroom with a Queen size bed.